Do you want to know how to relax more? Elite athletes, such as the two champions who recently operated at their peak performance for a five-hour tennis match, demonstrate an optimal natural pattern to their exertion. It is a Sprint/Recovery pattern, in which you focus intensely and then recover and replenish your energy by doing something that fully disengages the parts of your brain focused on work. It effectively rejuvenates you. For most of us, the optimum pattern is 90 minutes of intense focus followed by renewal. This number is based on our natural circadian rhythms that go in 90 minute cycles throughout the day. With this approach, you are getting energy from the natural rhythm of your body. In contrast, most of us work in a pattern that could be characterized as 'push-push-push' all day long, then fall over in exhaustion at night! One works without stopping, juggling tasks at her desk and running between meetings all day long. Because of the law of diminishing returns, by the end of the day, is down to 30% capacity. Out of a 10 hours at the office, this person does 6 hours of work. The other, by contrast, works intensely for approximately 90 minutes at a stretch, and then takes a 15 minute break before resuming work. At 12:15, s/he goes out for lunch for 45 minutes, or works out in a nearby gym. At 3 pm, s/he closes his eyes at her desk to breathe deeply for a few minutes. Finally, between 4:30 and 5, s/he takes a 15 minute walk outside. S/He feels comfortable working at 90 percent capacity, because s/he knows s/he's going to have a break before too long. S/he is still at 70% capacity at the end of the day. This person delivered 6 ½ hours of work - a half hour more than the first - and has made fewer mistakes and has energy left over for her/his family. Women - you in particular think that you have no time to take breaks. Read the passage I just summarized again! One of the biggest lessons I've learned in writing my new book about stress and success, is that our problem is not that we are 'always on' and push all day long. 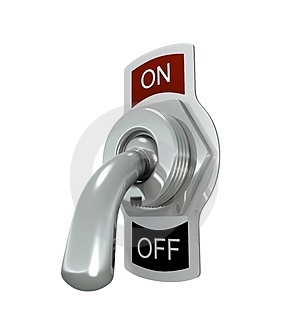 Our problem is that most of us can't find the 'off' button. We don't follow expenditure with renewal so we start to get depleted and have little reserve left. That's also why it's hard to get to sleep at night, you haven't trained your body to exert and renew, you've only trained your body to stay on. That's also why when you finally put yourself in a situation to relax, you crash. The best thing you can do to have 'all day energy' AND to have relaxation is to start to implement the Sprint-Recovery pattern into your day. Start with the times that you don't have meetings so it will be easier to schedule. When I interviewed Tony Schwartz I learned that it's the quality of your recovery, not so much as the quantity. Even if you only have 5 minutes in between meetings, spend it doing deep breathing or vigorous exercise. Spend even 1 minute doing this breath that will clear the harmful stress hormone cortisol from your blood stream: Breathe in slowly to the count of 3, Breathe out slowly to the count of 6. My favorite story is of my client who has a financial firm with seven employees. Every hour on the hour the alarm goes off and one person leads all the women in the office in 3 minutes of vigorous exercise. The women in that company are keeping their brains and bodies fit and fabulous. Three minutes of Lady Gaga can get me going, how about you? I'd like to get your thoughts on what you think the new title of my book should be. Can you take 15 seconds to vote here on the final version of the title of my book?